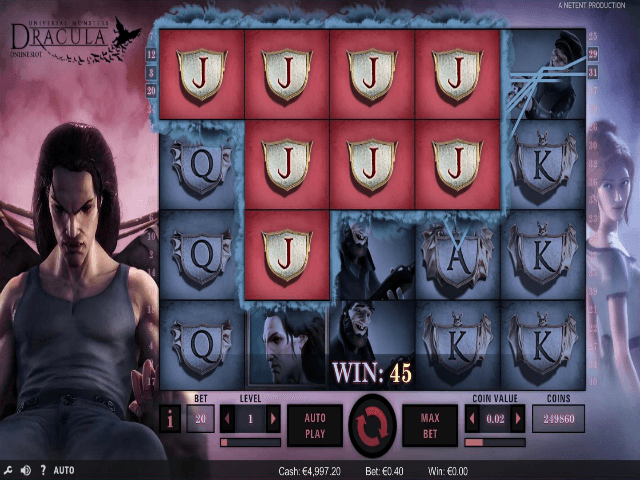 The Vampire King returns in NetEnt’s online slot game Dracula. This five-reel, 40-payline slot machine was made in collaboration with Universal Studios, who’ve created some of the best Dracula films over the years as well as a welath of other branded slots based on their top films like The Invisible Man and Creature from the Black Lagoon. Leave your stakes at the door as you read through this Dracula slot review to see if the most famous fanged villain in history is worthy of your blood! Play Dracula for Real Money! Irish writer Bram Stoker gave birth to Dracula in his gothic novel of the same name back in 1897. 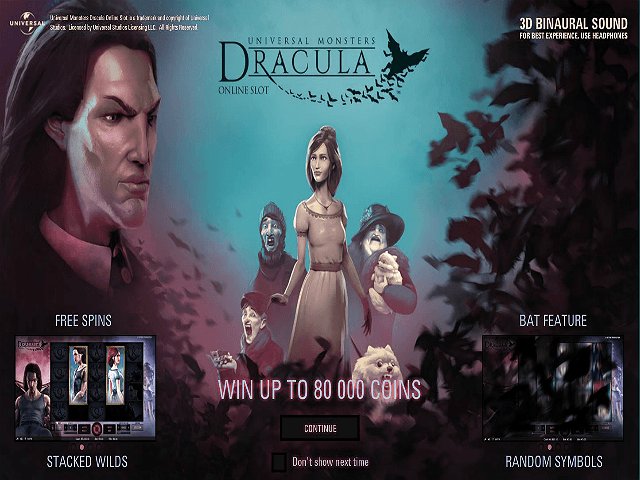 Although it’s been adapted across theatre, film and TV many times, the Dracula online slot takes its inspiration from the classic 1931 film produced by Universal. This adaptation, and its many sequels, changed the book and the myth for future generations. NetEnt has taken its inspiration for the design of the game from the films, forming part of the Universal Monsters series. 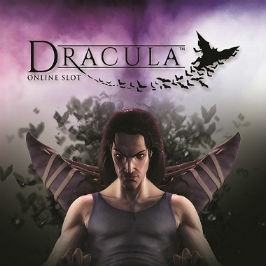 The handsomely chiseled yet dangerous looking Dracula sits in his throne, watching you as you spin the reels. Each press of the spin button sees a silhouette of bats fly out towards the boards, while in the background, Dracula’s true love lingers. Creepy sound effects and whispers may cause some players to shudder, but the pleasant return-to-player (RTP) rate of 96.60% should offset any shock. Just as Dracula is a classic, so too are some of the symbols the slot game uses, borrowing card letters J, Q, K, and A. Each is presented as a coat of arms on a shield, becoming more elaborate the higher you climb. 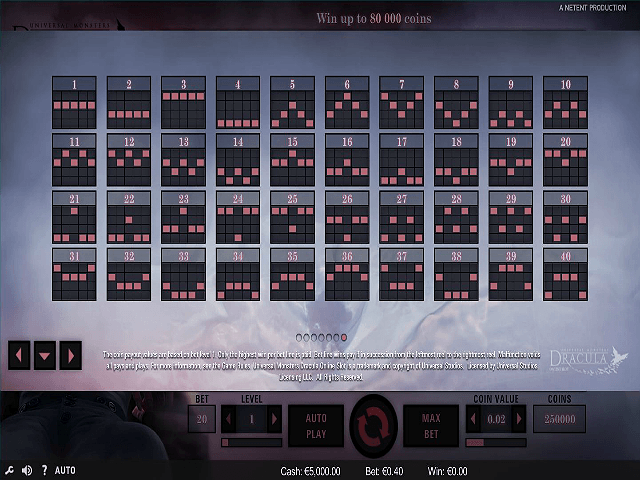 Despite the different appearance, they all pay a maximum of 40 times the initial wager if you land a full payline of five. There are also three character symbols depicting stereotypical Victorian-era citizens, from an affluent lady holding a doll, to a bearded man clutching a bottle, and a young beggar with money in his hand. There’s no hierarchy among this trip, with all of them paying a maximum of 60 times the bet if all five reels of the payline show them. There’s also a substituting Wild symbol, here displayed as a W drawn in blood. They only appear on reels two, three, and four and can replace any symbol on the board. There are also three Stacked Wild symbols. Dracula appears as one on reel two, while the Lady is the other on reel four. If these Stacked Wilds both land at the same time during the main game, the Free Spins bonus round is opened, with 10 free spins to start with. During the Free Spins, the third Stacked Wild, which is both characters in a lukewarm embrace, can be found on reel 3. If it lands fully visible, you’ll be granted two more free spins. The other bonus that the Dracula slot game has is the Bat Feature. It’s activated at random, and sees Dracula transform into a legion of bats landing on the reels. The cluster of bats will transform into a random symbol, including the Wild, offering you more ways to win. During the Free Spins bonus, the Bat Feature happens on every spin. Share this Dracula Review today! 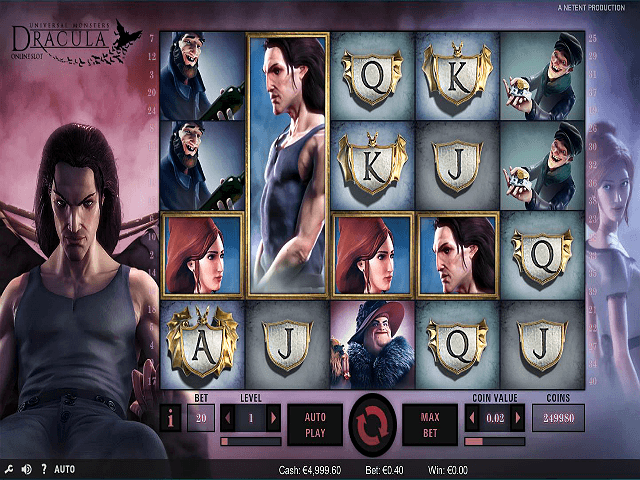 If you like Dracula, you'll love these slot titles too!